This understated little picture is the work of artist Giovanni Segantini, who is one of those artists who seems to have had an unnecessarily complicated life. 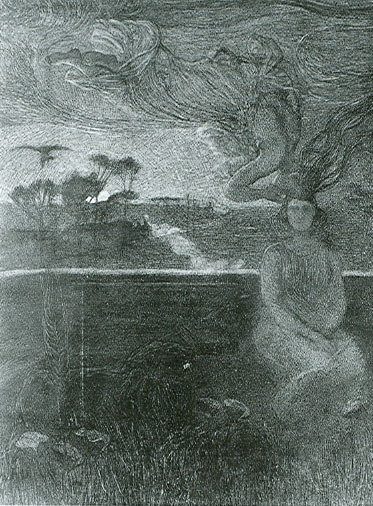 Virtually abandoned by his father who worked away from home, his mother suffered from depression due to the death of his brother the same year as Segantini was born. When his mother died, Segantini was left in the care of an older step-sister, who managed to make them both stateless after giving up Austrian citizenship and failing to gain Italian citizenship. This in turn would create more hardships through his life. Because apparently his life wasn't hard enough. He loved Luigia Bugatti, aunt of the car designer and sister of the art nouveau designer and manufacturer of home interiors, jewellery and musical instruments. Being stateless meant their marriage was impossible so the couple lived together and had children in a very bohemian way. Luigia taught him to read and write and eventually Segantini's art became successful, but looking at his work above, I wonder about how these relationships influenced him. The Angel of Life appears to be just a woman cradling a baby. The wings are so faint they blend with the clouds in the sky. This might be a comment on motherhood, that all mothers are angels, sent to cherish babies in their heavenly care. By contrast with the angel in Love at the Fountain of Youth, the woman with the child looks more of this world, less spiritual than the guardian of the Fountain of Youth. Segantini seems to have specialised in frankly odd landscapes with odd figures in them. The massive angel guards the tiny, bubbling Fountain of Youth as a couple skip towards her. Is love the key to eternal youth? Is happiness going to keep you young? It's hard to know what the painting is saying. The same is true of The Angel of Life and The Bad Mothers, although I think it's a safe bet that The Bad Mothers isn't saying anything cuddly. 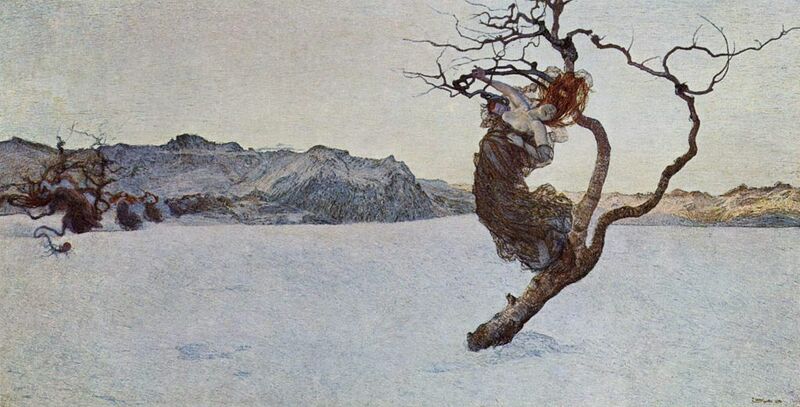 The Bad Mothers reminds me of The Punishment of Lust, both set in a frozen, barren landscape. There is a feeling that if nature abandons you then the punishment is wretched and without mercy. In comparison to Love at the Fountain of Youth, there is no angel waiting to save you or nurture you in your happiness. 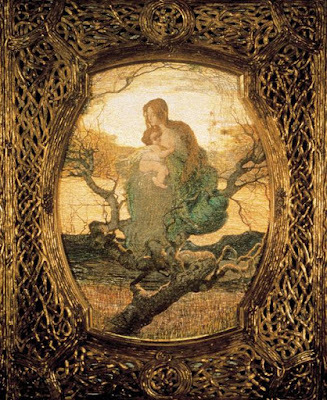 You are suspended, naked, in the cold rather than cradled in the embrace of your heavenly mother. 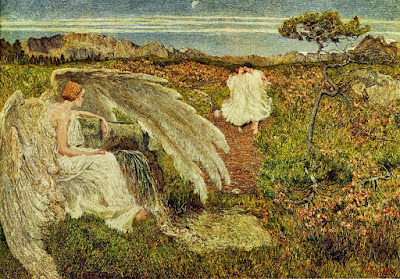 It would be easy to read a lot into Segantini's depictions of angels and mothers. A bad mother is hung out to dry on a tree, a good mother is an angel. 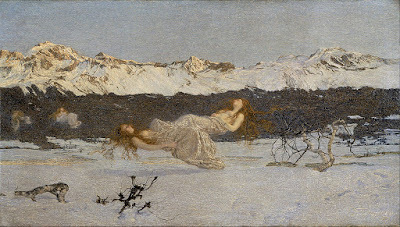 A bad mother is left in the sort of barren, frozen mountainous landscape that tortures women who succumb to lust (which in turn leads to babies and lacklustre motherhood, possibly in the same landscape). A good mother is like a thing divine, happiness and love are her watchwords. How did Segantini feel about his own mother, who mourned the loss of one child possibly at the expense of another? How did he regard his step sister, his surrogate mother who made him countryless and cost him the chance to marry his life-long love? Finally though, he had the love of the mother of his children, the woman who made him literate and gave him a family. Possibly she is his angel of maternity, the angel of love and happiness. For a bit at least as he dropped dead at 41. We were so close to a happy ending that time. Sorry about that.